Remembering Veronica Backof | Remembering Veronica Backof | De Soto Obituary Search | Dietrich-Mothershead Funeral Home, Inc. Remembering Veronica Backof | De Soto Obituary Search | Dietrich-Mothershead Funeral Home, Inc.
Veronica Frances “Bonnie” Backof was born March 5, 1931 in Tiff, MO. She was the daughter of Raymond and Martha (nee Boyer) Govero. 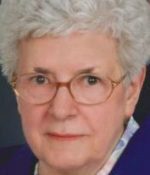 She died on May 3, 2016 in De Soto, MO at the age of 85 years. She is survived by her two sons, Bruce (Paula) Backof, De Soto, MO and Dan Backof, De Soto, MO; one grandson, Dalton Backof; siblings, Peggy Young, De Soto, MO; Barbara Love, De Soto, MO; Curtis “Bud” (Barbara) Govero, Tiff, MO; Clayton (Pat) Govero, Bonne Terre, MO; Maxine (Raymond) Johnston, De Soto, MO; Richard (Rae) Govero, Tiff, MO; Maryann (Bill) Bourbon, Tiff, MO and Ronnie Govero; Tiff, MO; sister-in-laws, Mary Govero, Tiff, MO and Jay Govero, Tiff, MO. She is preceded in death by her parents; husband, Charles E. “Sonny” Backof; two brothers, Phillip Govero and Paul Govero; and brother-in-laws, Frank Young and Harlan Love. 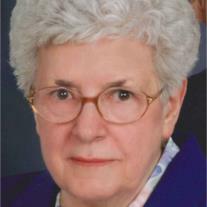 Bonnie was a member of St. Rose of Lima Church and the Daughters of Isabella Cirlce #659, De Soto, MO.